(ANS - Massey) - New Zealand is home to many immigrants and refugees from different countries. This nation of about 6 million people is delighted to welcome people in need from around the world so that they can call it their homeland. Salesian parishes in New Zealand also work closely with migrants, refugees and poor people. The Salesian Parish of Saint Paul at Massey, a suburb of Auckland, is an example of what many newcomers call home. In fact, immigrants are closely followed and accompanied by the Salesians and, on the other hand, the immigrants themselves often contribute actively to the life of the parish, and help to form the new face of the Catholic Church in New Zealand. Every Salesian is called to be a communicator of the Word of God to all people, especially the young. Every Salesian has the individual responsibility to preach the Good News with his life and actions. The Provincial Delegate for Social Communication of the Australia-Pacific Province (AUL). 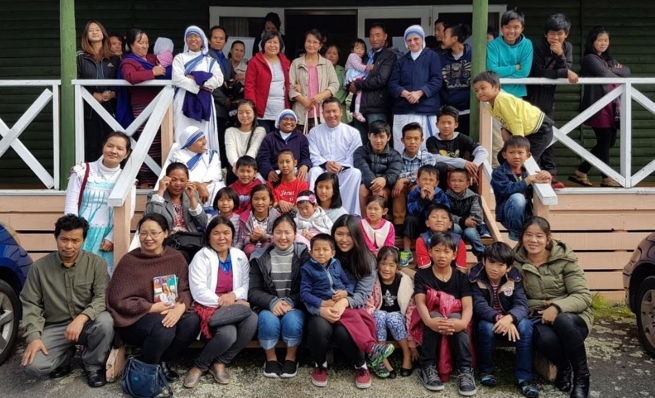 Fr William Matthews from Melbourne visited New Zealand 1-8 April, sharing the Word of God with Catholic communities originally from Myanmar, now established in Auckland and Wellington. During his visit, he attended several religious services and visited different families every day, listening to their spiritual, personal and social needs and history. The faithful, on their part, had the opportunity to share their everyday reality. Many Burmese Catholics were very happy to receive the visit of a priest who understands their language – Fr Matthews was born and raised in Myanmar. They were able to receive the sacrament of Reconciliation during Lent in preparation for Easter. Fr Matthews usually visits New Zealand two or three times a year to visit Catholic communities, especially those who are mainly immigrant. He brings a sign of God's love to the needy people who live in ”the Land in the Middle”.